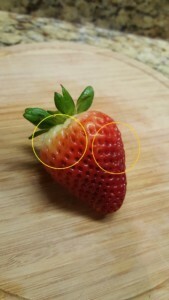 Today’s focus is strawberries. We took a look at watermelon and tyramine in this article some time ago. As mentioned then, tyramine is a biogenic amine and builds quickly during the aging process. Therefore, it becomes important to apply proper handling and storage in order to minimize food spoilage, as much as possible. As a general rule, you never want to eat foods that have been sitting for more than two days, and arguably, one day may be the maximum in most cases. Even when you are refrigerating fruits and vegetables, you may find it difficult to consume anything but the freshest of candidates. But what constitutes fresh? For watermelon, the over-ripeness could clearly be seen by cutting through the fruit. If you suffer from migraines, chances are good that you should avoid watermelon altogether. However, if you feel like taking a risk, areas that are too red, yellow, or “mushy” should be avoided. Let’s now turn to the delicious strawberry, our next installment in the series. Many of us have a love story with this particular fruit and consume it by itself, in ice cream, on top of pies, in compotes, and a variety of other ways. How about adding a little whipped cream? The fruit has important health benefits as well. Yet, as migraine sufferers, we have to be acutely aware of specific triggers that we could be exposed to, including histamines found in strawberries. In this quick post, we discuss certain ways of avoiding a strawberry-induced migraine episode. I am as excited as you are to welcome summer and all the amazing freshness that comes along with the season. For migraine sufferers, this unfortunately means more work to ensure that we safely consume foods. In terms of strawberries specifically, this starts at time of purchase. We cannot simply walk by the boxes of fresh strawberries and toss a few of them in our carts. Instead, we need to carefully inspect each individual fruit. I know – it is not fun when you are rushing to get out of the store. 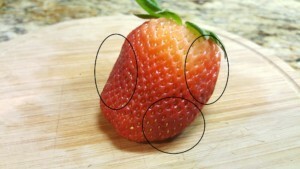 Even after purchase, the sides of each strawberry may need to be trimmed, regardless of a good pick. The work never ends! Picking only the best saves us time and effort later, but what are the characteristics of a safer pick? Be free from any visible deterioration on the outside, duh right…? Like everything else, taste can be a matter of opinion. Some will find a slightly sweeter and overripe strawberry preferable, while others may opt for more tartness, instead adding their favorite sweetener. Regardless, if you suffer from migraines, the former will likely be problematic. We need the ability to distinguish between the two. 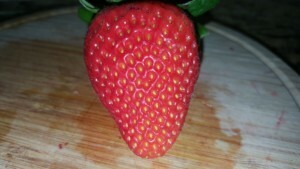 The good thing about the pictured strawberry above is that it leaves us with ample area to work with. The size and color are both decent. 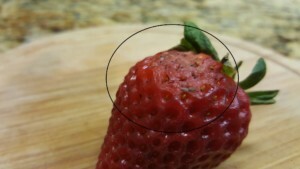 Yet, as can be seen, the strawberry has some developing issues and needs to be consumed in short order. 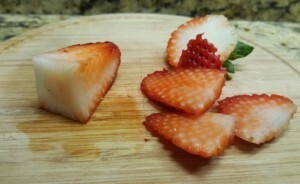 While the color is starting to change to a darker hue in the strawberry shown above, it appears perfectly fine to eat. Just to be safe, it is best to trim the sides. The color on the outside for this one is perhaps slightly on the redder side and the strawberry exhibits some minor deterioration, but the shape and consistency seem fine. As also seen above, the inside of this strawberry is not showing significant deterioration. However, the circled areas are starting to change color and consistency. The center-white area looks good as well. It is possible to salvage a good portion of the strawberry as illustrated below. 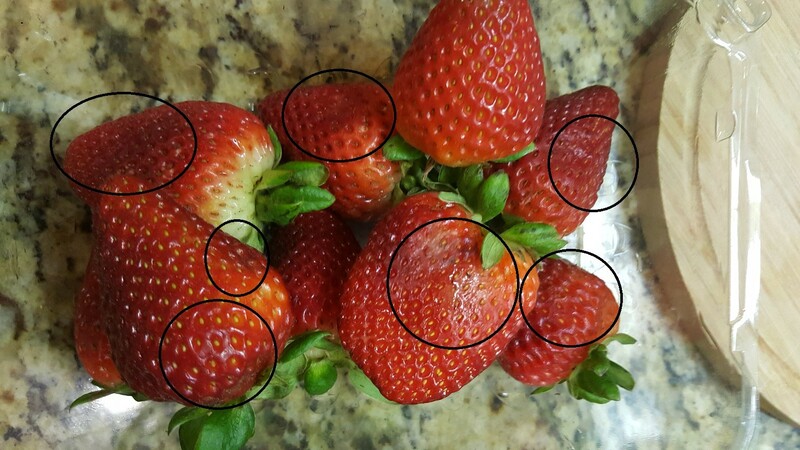 A box of strawberries can go bad quickly. Even the ripest and most well preserved fruits will not last long, especially in room temperature. Refrigeration is not always going to help. As already mentioned, picking the freshest of strawberries is paramount. Taking a look at the box below, we see clear signs of deterioration. 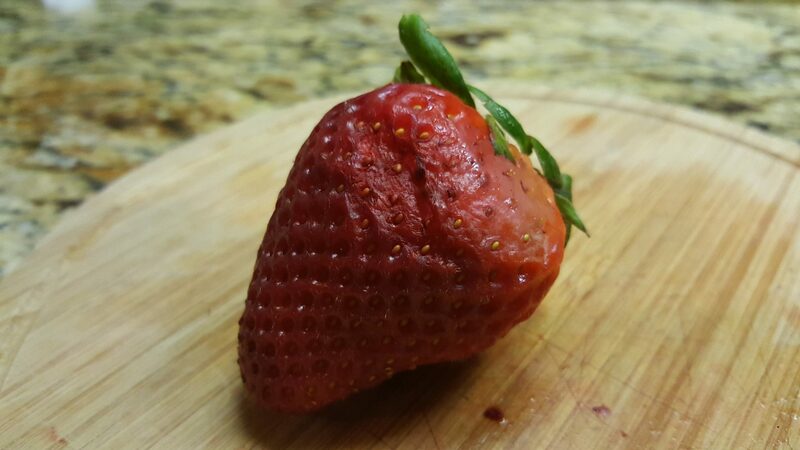 When one or more strawberries start to spoil, the entire batch can go bad very quickly. As can be seen, the strawberry above is showing a fair amount of deterioration. The outside has gone from dark red to pink in many areas. In addition, some spoilage is already visible. It has lost some of its natural form. Even without looking at the inside of this particular one, we should probably discard but let’s quickly take a look. 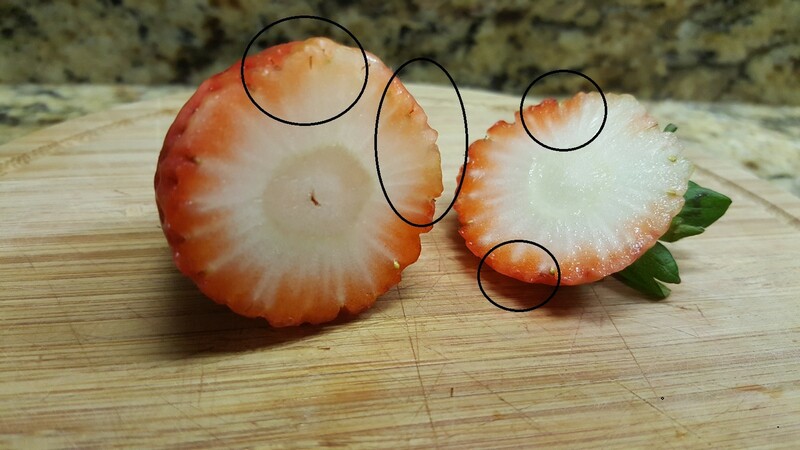 Cutting through the strawberry, there are clear signs of over-ripeness and worse yet, spoilage. 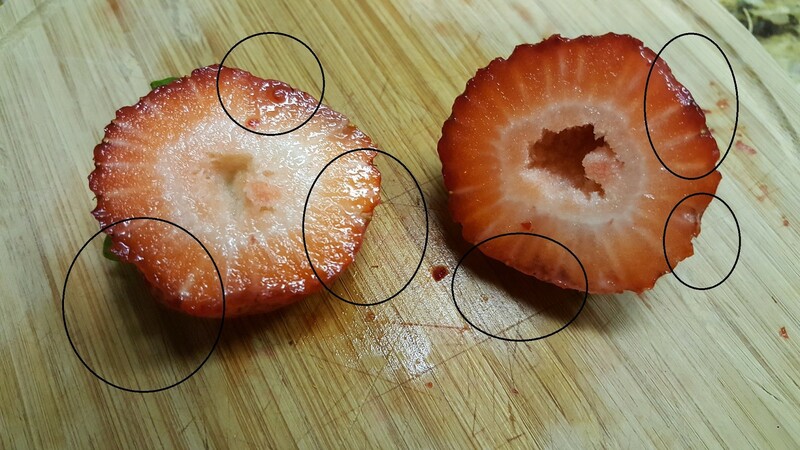 The outer edges are almost entirely translucent across the fruit. In one of the pieces, we can see the orange color clearly visible. The white center has diminished demonstrably in size. The safe bet is to discard and move on. Take your time choosing a box of strawberries and try not to purchase them when they are not in season. 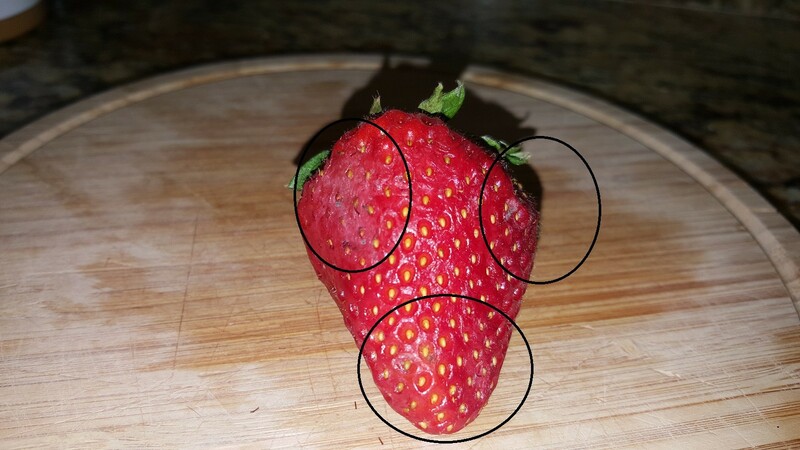 It is better to choose an underripe strawberry, as opposed to one that is overripe. You can always add your sweetener of choice if the extra sweetness in warranted. If you are worried about wasting money, do not purchase as much. It is better to go back the next day and purchase fresh strawberries.